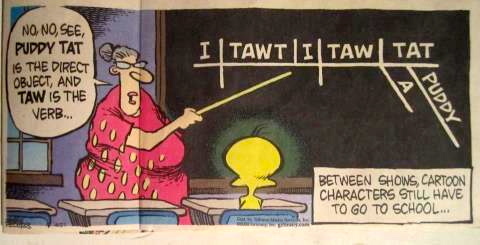 Sentence diagramming (in particular, a Reed-Kellogg diagram) in the comics. CAL is saddened by the passing of our cherished colleague and friend, Dora Johnson, on June 26, 2012. Dora joined CAL in 1964 and was at the heart of many of our activities for 45 years. She will be profoundly missed by all whose lives she touched. Thursday night may have been the last graduation the Edward Shands Adult School puts on. After 139 years of free basic adult education and ever-expanding offerings, including its high school diploma program, Oakland Unified School District has decided to close almost the entire adult school department. All that may be left would be skeletal literacy training for ESL students whose kids attend the school where they study. Some GED programs would be saved, but the complex in East Oakland named after Oakland’s beloved adult education leader, Edward Shands, will be shuttered. Shands has offered ESL programs, nursing assistance training classes, morning and evening GED classes, and the high school subject program in which students may take regular high school classes and receive diplomas in front of their friends and family. It is located next to the Eastmont Center and is convenient to the majority of students who live in Fruitvale, Central East Oakland and Deep East . I’m especially concerned about the ESL and GED programs, which are offerings with obvious significant public good. How will immigrants learn English, and how will dropouts get a second chance at a high school education? In my “Language shards” posting, I looked at some entertaining examples from language teaching materials — entertaining because of the absurdity (“Just you dare, zebra!”) or poetry (“The wind has come, bearing with it the scent of amber”) in them. This is a rich vein of material. Hey, one Romance language is much like another, right? Six things that Ann did in her life: horseback riding, acting, cooking, writing, teaching, learning languages. Words of one syllable department. Next week, students across the state will take Regents exams in foreign languages for the last time, as the state is dropping its tests in Spanish, French and Italian. This will save $700,000 a year, or to put it another way, roughly the cost of policing a homestand at one of the baseball stadiums. Do not be confused, dear citizens and students: the state still believes that it is important to learn foreign languages and culture before graduation. “With these exams, we actually tested our students’ skills at navigating through conversations,” said John Carlino, who teaches high school German, which was eliminated last year from the Regents testing scheme, along with Hebrew and Latin. At a time when it seems as if new tests are being devised every week, it is almost quaint to see the state dropping one series of them. Students will still need foreign language for the advanced Regents diploma, but it will be up to each school district to figure out how to rate their proficiency. “If they don’t have the money to print the exams, will the state have the money to check on what the districts are testing?” asked Mr. Carlino, who is also the executive director of the New York State Association of Foreign Language Teachers. To pass the current Regents exams, students have to show that they can carry on a conversation, grasp what they are being told and also make themselves understood. They also have to show that they understand the cultures of the places where the languages are spoken. It is not just a matter of filling in the circles on a multiple-choice test. We don’t need foreign languages. We have English. A good sentence should be interesting. Can you change the following sentences into interesting sentences? On the basis of that, the kids were unleashed on six other sentences, like “I have a bicycle”. You are currently browsing the archives for the Language teaching and learning category.